Since arriving in Austin, TX in 2002, Vic has been an integral part of the growth & success of Lonestar Soccer Club. Vic was the Boys Director of Coaching for CC United Longhorns pre-merger in 2004. Prior to arriving in Austin, Vic was the Assistant Director of Coaching for the Classics Soccer Club (Houston, TX 1996-2002). While in Austin, Vic has been responsible for clubs success at the State & Regional levels. Several players under the direction and guidance of Vic have gone on to play in college and the pro ranks. Vic’s experience in coaching and playing spans over 25 years. 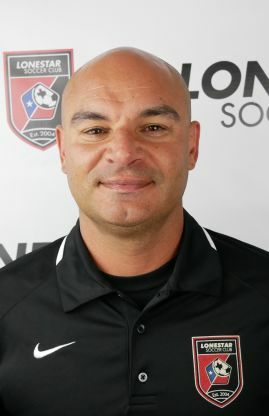 Prior to coming to Texas, Vic was player/assistant coach for the South Carolina Shamrocks of the USL Select League (1994-1996). In 1994, he was the Head Women’s & Men’s Assistant Coach at Spartanburg Methodist College in which the Men’s Team won the NJCAA National Title. He is married to Darlene (Campbell) and has two children, Megan & Keagan.